Bump. There it was. A quick snap of the wrist picked the jig back up before it had time to snag on the bottom. Again, he followed the line with his rod tip and waited for the bump as the lure fell. Watching the drop. Anticipating. Any moment now. Slam! Daniel set the hook and fought another 24-inch football-shaped striper to the side of the boat. That made seventeen in 90 minutes – a fun evening of catch & release fishing very close to home. It’s the first day of the new year and if you’re like me, you’re still trying to recover from the chaos. Amidst this flurry of activity, I’ve finally found a few minutes to grab a hot cup of chicory-laced coffee and sit down on my front porch to reflect on the activities of the season. The holidays bring fun times with family and friends, hopefully a few minutes of fishing, and usually a few material blessings. Santa brought me canvas curtains for my boat this Christmas. (Okay, he’s still making them, but they’re on the way.) I also found a new medium power, extra-fast action casting rod under my Christmas tree. My sons got a few gifts to help them with their music careers and my grandkids are inside playing with some educational toys. All this and the technical aspects of last night’s successful fishing trip has me thinking about the tools we use in pursuing our passions and professions. Last Thursday, I spent the afternoon with Tony and Dee Tochterman at their tackle store in the Fells Point section of Baltimore. I’m amazed any time I visit their shop, but even more so this time since they’ve recently added a new lure making and fly tying room. Simply put, it is the biggest collection of lure making supplies, tools, books, and gear I’ve ever seen under one roof. In addition to lure making supplies, Tony also has a fantastic collection of rods and reels and industry designed lures. 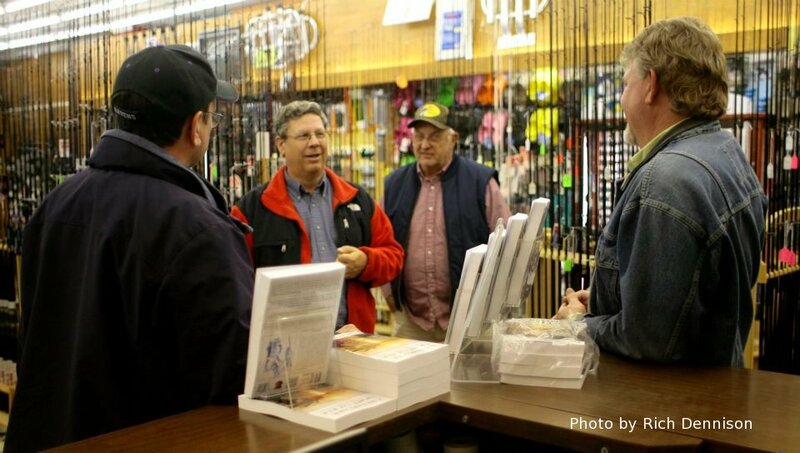 No doubt about it, Tochterman’s has all the right stuff for Mid-Atlantic fishing. 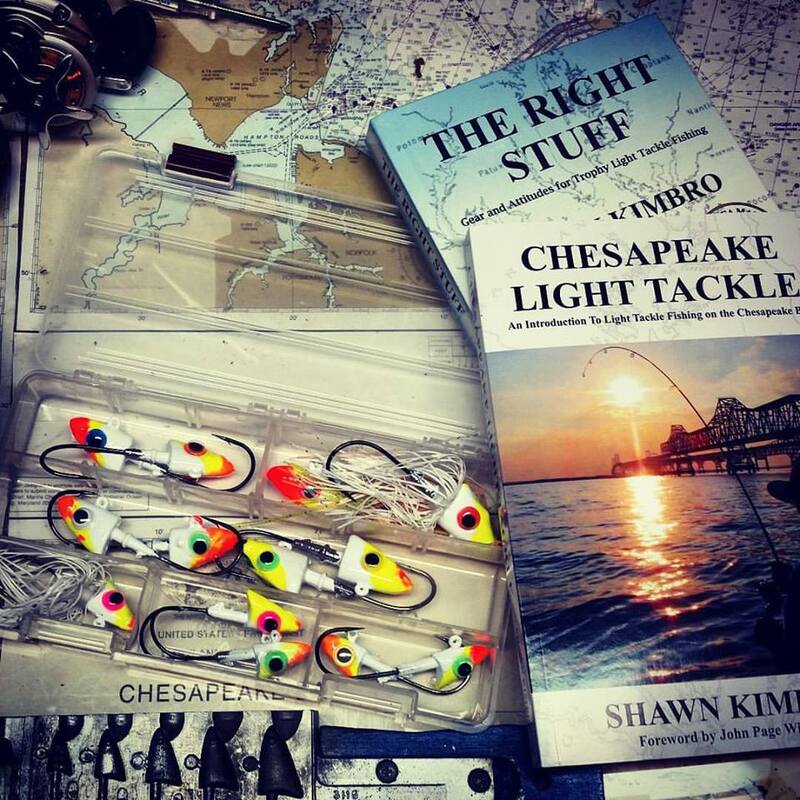 I’ve been extremely impressed by the quality assortment of gear that can be found in local bait stores in the Chesapeake Bay region. I plan to visit many more since I’m in the process of marketing my new book, and I’ll be sure to report back. Daniel and I recently sat down at a local bar over a beer and discussed similarities in the tools we use in our trades. We compared musical instruments to fishing equipment. A Brazilian rosewood guitar or a hand-carved European upright bass won’t make you a good musician. There may come a time for instruments of that quality, but it’s overkill for a beginner. On the other hand, anyone learning to play should use an instrument that is of high enough quality to show a respectable return for their effort. Instead of overcoming technical limitations, your practice time is better spent learning the notes and chords you want to play. The same is true with fishing equipment. Anyone learning to jig would be foolish to spend several hundred dollars on a top-quality rod or reel, but they will need an outfit that doesn’t make it difficult to recognize strikes or feel a lure touch the bottom. The wrong stuff makes it harder to catch fish, the right stuff makes it easier. In other words, in music or fishing, you don’t want anything that gets between you and the expected reward. I usually recommend off-the-rack rods in the $100.00 price range and reels of $75.00 to $100.00. 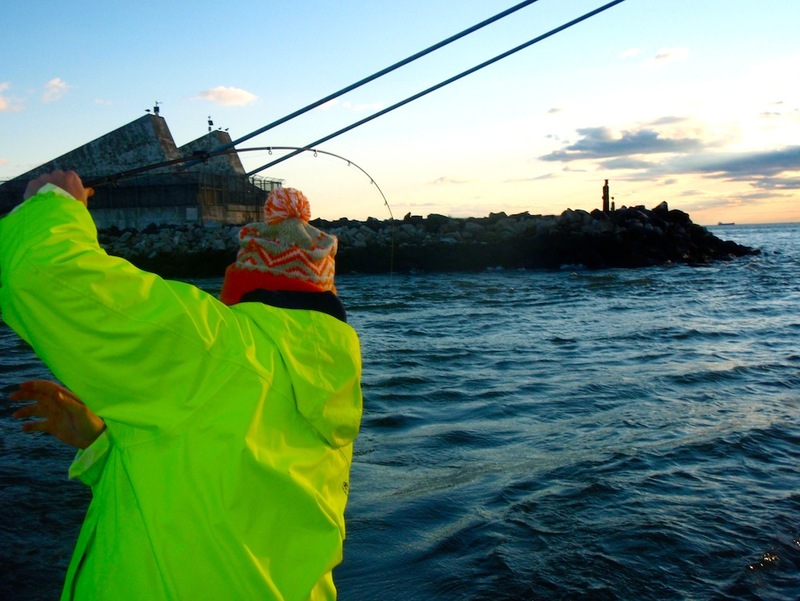 A sensitive rod is by far the most important factor to consider. I devoted an entire chapter in my book to rod and reel selection. There is a condensed version here on this website. If you don’t know where to start, I highly recommend talking to someone at the local tackle stores and bait shops in our area. I’m getting to know these folks fairly well and I can tell you first-hand that most of them know what they’re talking about. If you need a recommendation, drop me a line and I’ll steer you toward a shop that is sure to equip you with the right stuff. 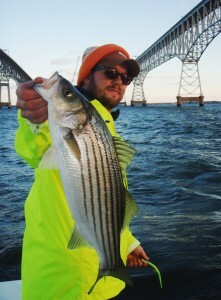 Maryland Chesapeake Bay ca tch & release season is in full swing. Water temperatures haven’t changed much (mid to high 40s) and the patterns are about the same as in last week’s report. There are still lots of two- and three- year-old rockfish holding around the Bay Bridge rockpiles with an occasional bigger fish thrown in. In my Bay Bridge chapter of the book I explain exactly how to find them. 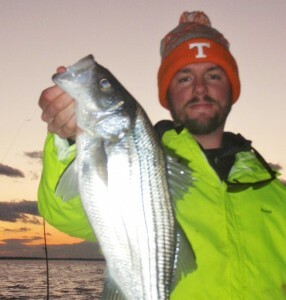 Some of my buddies are reporting decent fish on the ledges on both sides of the channel in the Breezy Point area. 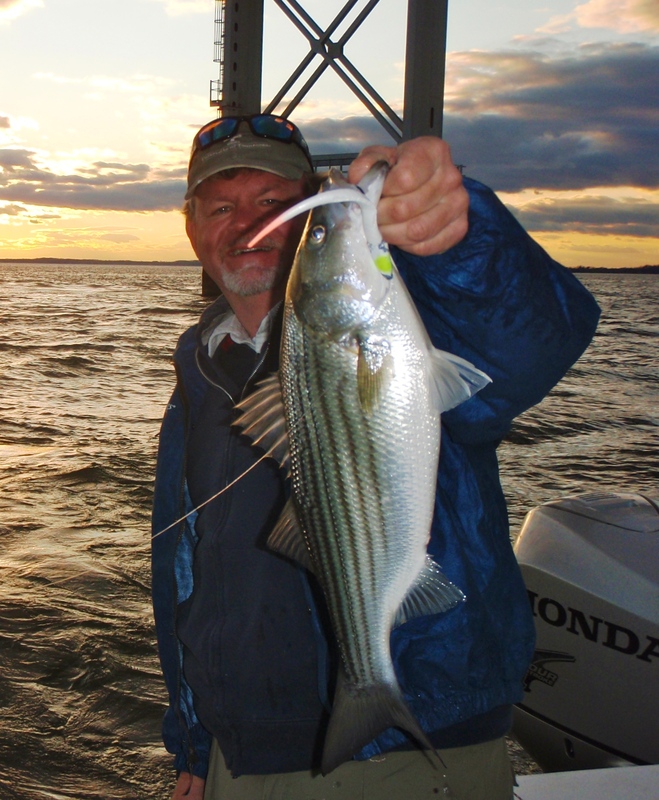 The warm water discharges are still slow, but holding a few fish, and the upper Bay rivers are still turning out schoolie stripers. Those willing to travel are finding big fish in the ocean from Chincoteague down almost to the North Carolina state line. Most of these fish are way out past the three mile line, but there are a few schools showing up closer to shore. Pickerel fishing in area creeks and rivers is very good. Yellow perch are slow at the mouth of the Susquehanna, but things should improve with the impending cold weather. White perch fishing is okay in the deep holes in the rivers and around the Bay Bridge. Options are plenty and things are shaping up for a good winter for Chesapeake Bay fishing. Just wondering if you had any intel on WWD release times at Brandon Shores ? is it ramdom, often, week days, anything you can tell me would be appreciated. By the way love your book ! got it as a xmas present, finished reading it and will continue to go back over and over as a reference. “Carolina Skiff 19” as a TFer. Kip, I spent some time about a year ago talking to one of the engineers at Brandon Shores. It’s all computer driven based on power demands on the Baltimore grid. About the only thing you can do is go and find out. Also, keep your options open because there are several more WWDs in the Patapsco area. Also, glad you got the book and thanks very much for the comments! Ordered you book just before Christmas and received it very promptly–thanks for a very professional delivery. I did get your autograph, but I must have missed the numbers that were supposed to be written in the margins ! Guess I’ll have to read it again, maybe I missed them. I’m trying not to smudge anything as I know it will be very valuable someday! I had the pleasure of meeting you at Tochterman’s at your book signing. thanks for the tips you shared with me on catching suspended fish. What a way to start 2012, Shawn! 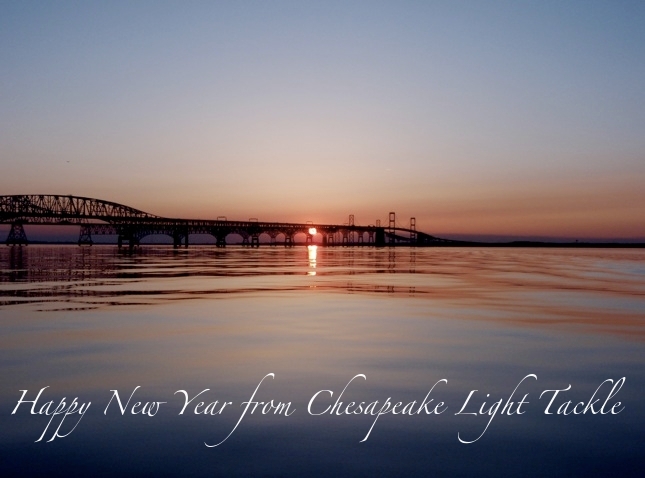 Hope you & the family had a great Holidays…Happy New Year! Can someone tell me how to find 99.9% lead ingots? I remember having plenty of those items yesterday. Glad to see Daniel is over his slump. Where would I be able to fing pickerel this time of year? Shawn,Good to see LT University is alive and well.Good stuff ! I liked your fishing/music gear analogy. Getting top of the line gear as a beginner is indeed overkill, but I agree that having nice gear is a plus. I’m a beginner drummer, and the Roland TD-6 module was good enough for the first couple years. I just moved up to the TD-12 module, it has helped to make me a better drummer, and I will be growing into it for a few years. I consider myself a mediocre light tackle fisherman, and I will be moving up to a Lowrance HD-10 chart plotter with side scan this year (that model number sounds awfully close to the drum module model number). As in music, better gear to someone with a few years under their belt will help their game, but the ultimate key in either case is to get out and practice, practice, practice. The HD-10 will vastly improve my game, but is only an aid. I will be growing into the new meter the more I practice fishing with it. Thanks again for the good work and tips, and happy New Year! This after I just winterized my boat. Also, I just ordered a copy of your book. Can you sign it for me? Don, would be a good idea to fish with Shawn and let him fill you in on the exceptional detail on the new Lowrance..I was fishing with him one evening and a local guide called him and asked him how to read it.. In order to make the move from a mediocre light tackle fisherman to a very good one is to leave the broomsticks at home..that way you only concentrate on light tackle and don’t slide back into the easy trolling thing..(just my opinion)…trolling is by far the easiest way to catch fish in the bay..
Don’t you have the same system? You’d be a great guy to show someone how to use that new Lowrance and catch all those big fish on Wednesdays! Plus I heard you play a mean drum set! one of you guys help poor ole Don out ! Ps, and you might need me to help watch too ! Capt Jimmy I can’t afford one of the fancy Lowrances..I have an Ol’ Furuno.. Wed is a bad day to fish anyway..thinking about fishing more weekends this year.. Daniel..I never said you were in a slump…but Rich did..
Age before beauty fellas. Happy New Year. Speaking of beauty, take a look at the 48″ Dad hauled today. I just saw a picture of Shawn’s fish from yesterday. I’d say congrats but I don’t think that’s too unusual for him. I’m going fishing at the Bay Bride this weekend if I have to rent a boat.